Ponds and water gardens can host a variety of animals, including fish, turtles, ducks and frogs. But one animal that many pond owners overlook are snails. As children many of us saw snails as being gross, and a lot of adults have a similar attitude towards them. However, these animals play an important role in the ecosystem, and when present in your pond can bring a number of benefits to it. The snail is a type of gastropod which is shelled. Like turtles, they can retract into it for protection. In addition to freshwater snails, there are also sea snails, and those that lack shells are referred to as being slugs. Throughout history these animals have been very important to humans, serving as a source of food in some cultures, and in others their shells were used as a form of jewelry. While they are commonly associated with aquatic environments, snails can also be found in deserts. Most species are herbivores, and use their radula, or tongue, to break down food such as plants. Some land species however are carnivores. They are fond of eating algae, which means when present in ponds they can keep it under control. They are best seen as being natural janitors, but in ponds that are well maintained, they will serve more aesthetic purposes. A snail should not be seen as a solution to serious pond problems, particularly involving water quality. If your pond water turns green, for instance, this is because of planktonic algae blooms, which will be much too small for them to consume. Snails are better adapted to eating slime algae. Another mistake that some pond owners make is attempting to use snails to control pond sludge. Now, it is certainly true that the snails will consume the organic debris that they come across in the sludge layer, but in most cases they will have a greater preference for healthier algae, which is responsible for maintaining the pond’s cleanliness. This means that in certain circumstances the snails can actually make the situation worse. Another thing to remember about snails is that they breed quite rapidly, and if too many become present in the ponds, deceased snails will merge will the sludge and make it worse. Snails should be seen like fish, frogs, or turtles, which is an animal that will make the environment more interesting and attractive. While snails will help in cases were string algae are present, they shouldn’t be relied upon to do so, especially at the expenses of cleaning the pond manually or using other types of equipment. 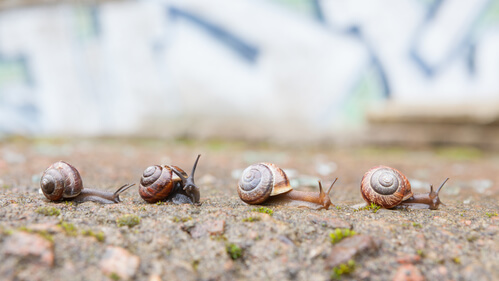 Another thing to consider is that if you have other pets or animals already residing in the pond, they could see the snails as being a source of food, and may prey on them, so you have to exercise caution when introducing them.